My friend Barb frequently sends me recipes to try. I love them as she is an Aussie and its usually something totally new to me and my family. Recently she sent me a recipe for 'Lamingtons'. They were amazing. 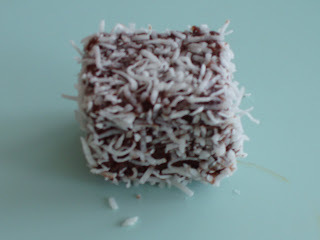 A little square of cake dipped in a warm chocolate frosting and then rolled in coconut. very yummy. Hubby felt that he was in heaven. I made a few changes in the recipe to accommodate the ingredients we purchase here but you can click the link above and see the original. The piece shown is about 1 1/2 inches square. Grease 9 inch square pan. Beat eggs in a medium bowl with mixer for about 10 minutes or until thick and creamy. Gradually beat in sugar, dissolving after each addition. Mix the 3 flours together and fold into the egg mixture. Do not beat, but gently fold into the eggs to preserve the air bubbles. Spread mixture into the prepared pan; bake in 350 F oven for about 30 minutes. Turn cake onto a wire rack to cool. Cut cake into 25 squares. At this point you can leave the cake over night to get a bit stale, it will absorb more frosting this way and be more chocolaty. Sift icing sugar and cocoa into heatproof bowl; stir in butter and milk. Stir icing over pan of simmering water until it is of a coating consistency. Dip the squares of cake into the icing and cover the cake completely. I used a 2 prong roasting fork. Then roll the coated cake in the coconut. *** To make self raising flour. Place 1/2 tsp baking powder and 1/8 tsp of salt in the bottom of a 1/3 cup measuring cup. Fill with all purpose flour. Mix well. Darilyn has posted her instructions for microwave bacon without the stove top spatters. 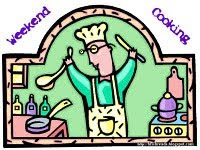 Visit 'Weekend Cooking' over at 'Beth Fish Reads' to see what other bloggers have been cooking this week. Wow, that looks amazing! It also looks like a lot of work. actually, it wasn't that bad at all. you bake the cake one day and then do the frosting and coconut the next. I love bite-sized food...thanks for sharing this recipe! I haven't heard of these but they look perfect to taking to a picnic or for a buffet table. Yummy. Tiny cakes appeal to me, too. And I love coconut. I think I will try this one. Does the cake taste like or crumble like corn muffins do? The cake is very nice, but I wouldn't eat it without the coating. Its a firm texture with lots of little bubbles. Not at all like a corn bread. its more like a honey cake though not as sweet. I think this is because of mixing the eggs for 10 minutes. They become almost like a meringue.